Can I Give My Ferret a Bath? | Can i Give My Ferret? Can You Give your Ferret a Bath? 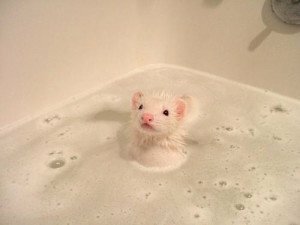 Many new ferret owners, particularly those who are more sensitive to the naturally musky scent ferrets, are tempted to regularly bathe their pets. Undeniably, bathing ferrets remains to be a controversial topic, especially in terms of frequency. The unfavorable scent of ferrets is partially due to the natural oils from their skin. Giving your pet a bath may temporarily reduce this musky scent. However, bathing actually stimulates an increase in the production of skin oils, so their scent may become even stronger for a few of days after the bath. Can I Give My Ferret a Bath? Yes, but not too often. Bathing a ferret tends to dry out the skin and coat, so it is recommended not to bathe your pet too frequently. It is suggested that you only give your ferret a bath only a few times a year, or no more than once a month. Of course unless your ferret has gotten into something that must be washed off immediately. Many ferret owners tend to think that bathing their ferrets as often as possible will help reduce odor. Unfortunately, it will not. It will actually make the smell even worse. It will cause not only odor but also skin problems. Washing strips the essential oils in your ferret’s skin. In turn, his skin will become dry and itchy. Cracked skin due to dryness will also allow infections to enter the body. All this dryness will cause your ferret to produce extra oils that are absorbed by the fur. In the end, you’ll only have a smellier ferret. Pick a comfortable spot to bathe your pet. It is suggested to consider the weather in and outside your house whenever you give your ferret a bath. If the temperature outside is too low, say it is winter time, then you should bathe your bunny in an enclosed, warm area. If the temperature outside is too high, then it would best is you bathe your ferret in a more open area. Always check the temperature of the water. Keep in mind that a ferret’s body temperature is a little higher than a human’s. Water that feels warm to you may still feel a little cold to your pet. But of course you do not want to burn your little pet as well. The normal temperature of ferrets is between 99°F and 104°F. Never use human shampoos or dish soaps. Only use shampoos that are designed for ferrets or kittens. Shampoos for humans have incorrect PH balance for ferrets. Using shampoos with added scents should also be avoided, for this may cause allergic reactions. You can use some conditioner. But it should also be specially formulated for ferrets or kittens. Rinse your ferret thoroughly, everywhere. Make sure to completely rinse out all the shampoo and conditioner. Ensure to rinse even the hard-to-reach places like the throat or armpits. Shampoo residue on skin may cause your pet to get itchy. Clean your ferret’s ears. You should clean your ferret’s ears every few weeks. Yes, it should be more regular than bathing. This is to avoid ear mites. To clean your pet’s ears, you can use a cotton swab moisten with an ear-cleaning solution designed for kittens. Remember to only clean the part you can see and never push the cotton swab into the ear canal. Brush his teeth. It is recommended to brush your ferret’s teeth at least once or twice a week. You can use a cat brush and cat toothpaste to clean your pet’s teeth. It is important to brush his teeth regularly to prevent tartar buildup. It would also help if you can give him dry food frequently to help lessen tartar accumulation. If you find it hard to clean his teeth, then you should ask the veterinarian to do so each time you visit him. Using a towel to dry a ferret is usually sufficient. Ferrets also dry off quickly. However, make sure your pet does not become chilled when still damp. You can also use a blow dryer. Just keep the dryer on a low setting and keep it at least a foot away from your ferret. Put extra towels on the floor. It is suggested to place some extra towels on the floor after you wash, rinse, and towel dry your pet. He will most probably use these dry towels once you put him down. Ferret care includes taking care of your pet’s hygiene needs. Knowing the proper hygiene routine and procedures will help you have a have a happy and healthy pet. I only bathe my ferrets twice a year at the end of summer and begging of fall and then at the end of winter beginning of spring but I do everything else like brush teeth, clean ears and clip nails once a week. I worry when I give my ferret a bath she almost falls asleep! Is this normal? So today was my first day washing my ferret and it went completely horrible. I put him in the warm water to get use to it and he was fine and loving it. But as soon as I started to put he shampoo on him he went completely insane. He jumped out of the tub and stated to shake really bad. I don’t now what went wrong and I could barely rinse the soap off of him. I don’t know what to do. And he still smells really bad. bathe him and while they’re at it clip his claws, clean his ears, and brush his teeth (if you don’t have a groomers in your town then the vet can always do it).